BMW surely envisioned the X1 as “best of both world’s” type of vehicle, but truthfully we just can’t see why anyone would pick this over the 3 series or the X3, especially when one offers better driving dynamics and about the same storage, and the other offers more carrying capacity and better cabin room. Lack of driver assistance technology"
What happens when you take the driving attributes of BMW’s heralded sedans and mix in the added utility of the X lineup? Well you get the X6, X5, and X3. 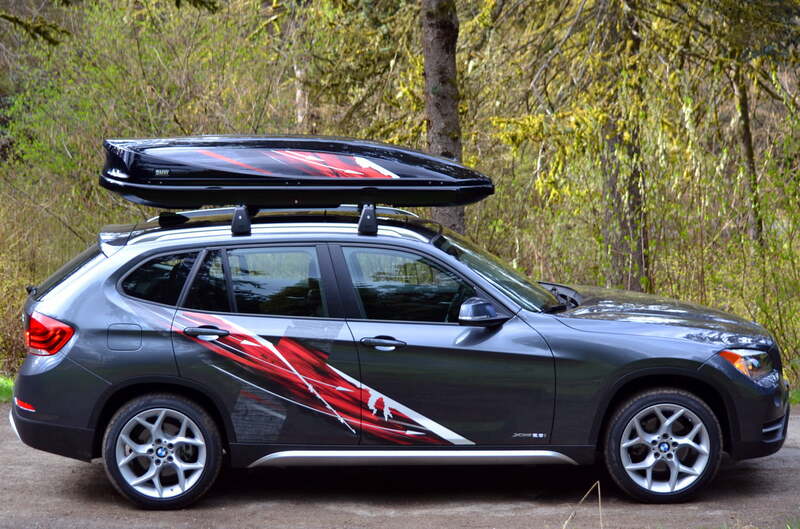 Now, however, the German automaker is welcoming another vehicle to its North American lineup: the all-new 2013 BMW X1. “All-new” might be a bit of misnomer as the X1 has been making the rounds in Europe for about three years now. With the X1, it appears BMW is still trying to replicate the near-mythical performance of the 3 Series with the versatility of its popular crossover SUVs. Our review model came packed with BMW’s Ultimate package ($6,650) which bundles together the Premium and Tech packages to include a Panoramic moonroof, power seats with driver memory, keyless entry, and leather interior to name a few amenities. Is Bavaria’s baby Bimmer up to the task? Or does it prove as thrilling as a wet diaper? We took to the road to find out. 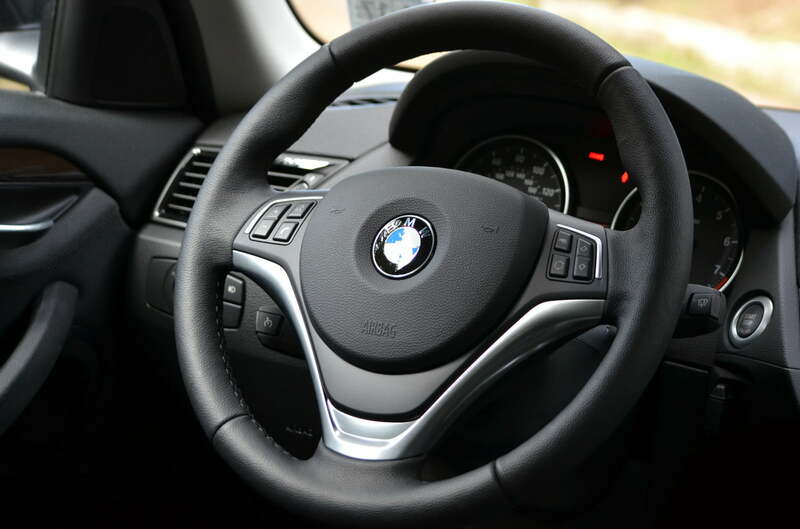 The BMW X1’s Technology Package included a number of upgrades to many of its standard features like Bluetooth audio streaming and BMW Voice Command, which allowed us to make phone calls entirely hands-free as well control various navigation functions by voice alone. The X1’s nav system, branded as iDrive, features a large 10.3-inch LCD screen mounted into the dashboard and is turned out well, with detailed maps that can be viewed in 2D and 3D. The nav system provides real-time traffic alerts and utilizes a hard-drive, which allows for quicker interfacing than typical DVD-based systems. 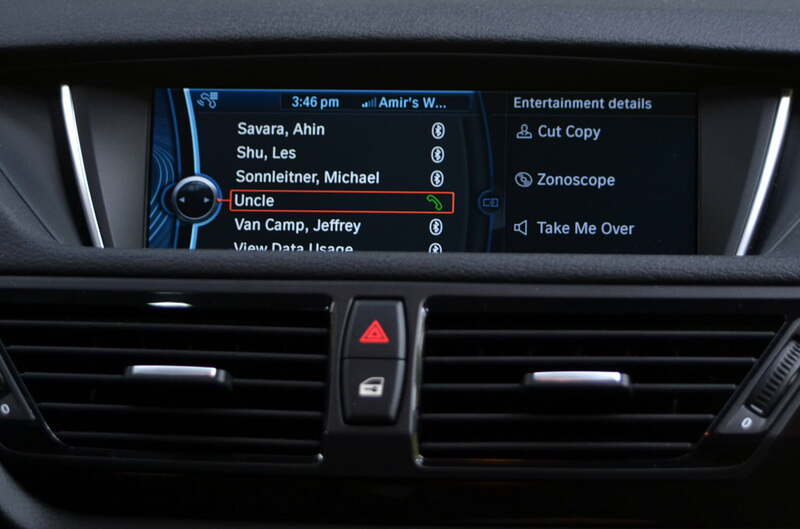 Because BMW’s latest iDrive system utilizes a 1.3 GHz processor with built-in 3D graphic chip, there is almost zero lag when shuffling back and forth through the menus. Plotting out routes was straightforward, with the voice recognition software doing a good job of understanding spoken inputs. 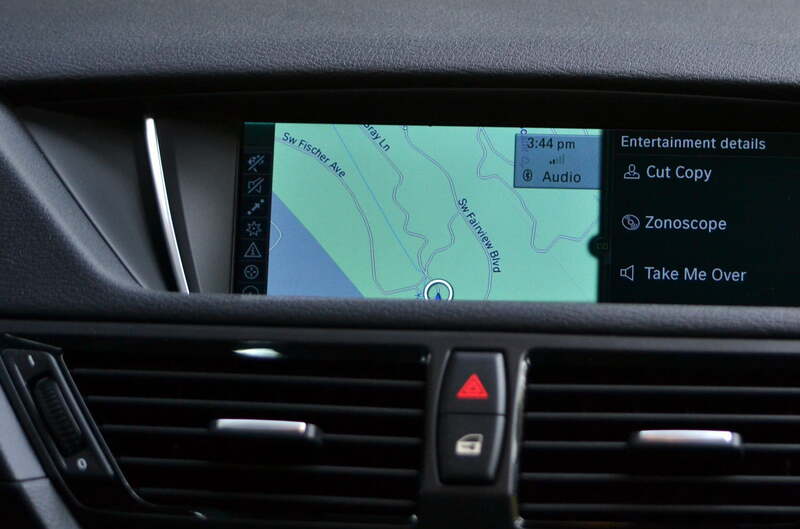 We were also able to use BMW’s ConnectedDrive telematics service to perform local Google Searches for locations and then conveniently input them as a destination. In addition to spoken turn-by-turn guidance, iDrive splits up the LCD screen for upcoming directional prompts so you can see on the screen exactly where and how you’ll be turning. That same split-screen interface was also used to display whatever media we were listening to at the time. For those wanting full-screen real estate dedicated to just nav, there is an option to disable the split-screen. 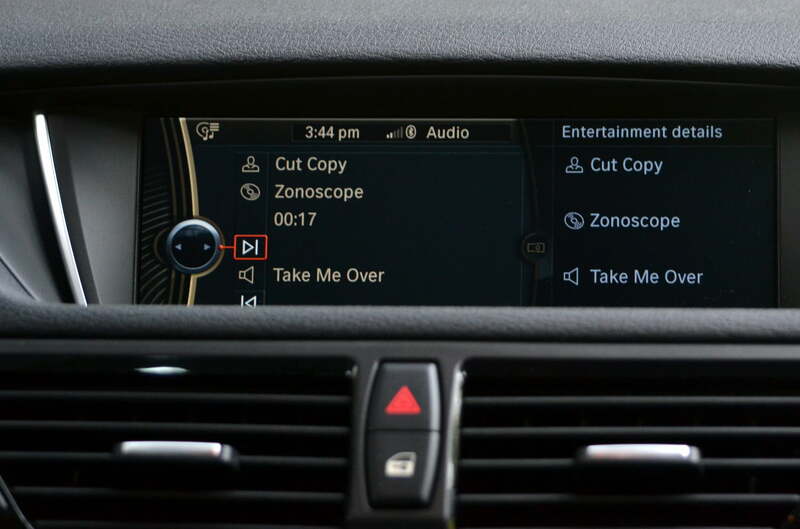 Additionally, iPhone users will want to opt for BMW Apps, which is a $250 option and integrates the aforementioned Connected Drive suite. Here, drivers can access their Facebook and Twitter Feeds, send pre-written Tweets, and have those read aloud via the onboard voice system. Again, this is limited to iPhone only, so Android and Windows Phone users are out of luck at this time. 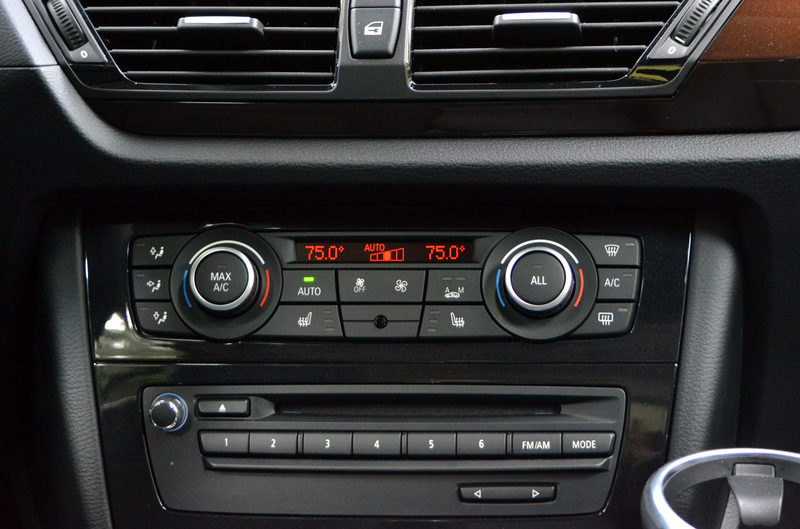 As in other BMW models, control of iDrive is done primarily with a controller knob mounted on the center console. Here, you’ll find dedicated buttons for media, menu, telephone, navigation, and radio, as well as a back and option button, which, logically, when pressed provides additional option settings for each menu function. 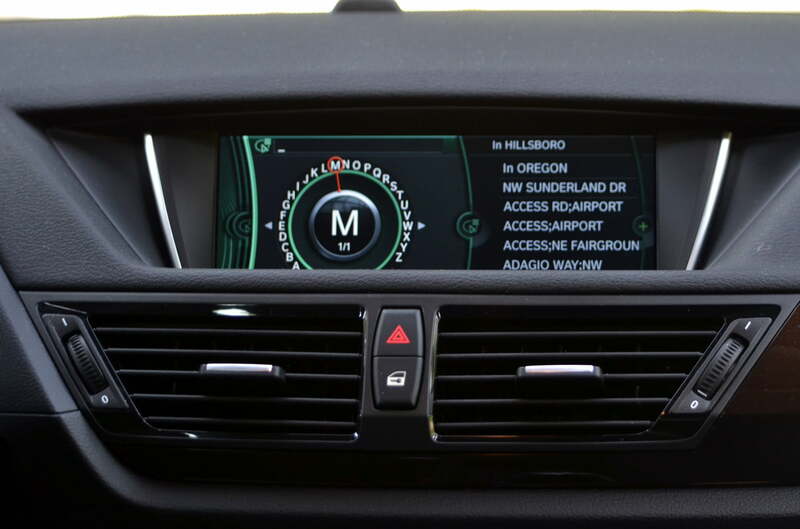 Acclimating to the rotary controller can take some getting used to, but after a brief honeymoon period, navigating BMW’s interface became second-nature. While streaming music via Bluetooth or a USB device is our top choice, the X1’s also features more standard audio sources, including AM/FM radio, HD radio, and a single disc CD player. The last option allowed us to burn music from a CD straight to the X1’s 20gb hard drive. What’s more impressive is how much we enjoyed BMW’s base eight-speaker, 180-watt sound system. Audio fidelity was sharp and rich, funneling every note into our ear with surgical precision. Of course if that’s not enough, BMW offers an upgraded 11-speaker, 340-watt Harman/Kardon system for an additional $875. Sadly, BMW’s tech showcase comes up a little short when sifting through its driver assistance features — or lack thereof. Our X1 came with BMW’s Driver Assistance Package ($950). And while we were certainly impressed with its stellar rearview camera system — which features dynamic trajectory lines and integrates with front and rear mounted sensors that provide audible warnings when approaching too close to an object — the absence of any sort of forward collision mitigation system, lane departure warning, and blind-spot monitoring system is a real disappointment. BMW isn’t exactly known for its riveting interiors (some would argue its design language has also grown stale) and the X1 doesn’t tinker much with that formula. The X1’s interior is so familiar that were you to enter it with a blindfold and with all logos removed, you’d immediately know you were sitting inside one. The cabin features the sterility of an operating room with the excitement of an empty bank vault. And for some strange reason we couldn’t love it more. Automakers have taken to penning cabins that are more Starship Enterprise than car, so were happy to see BMW sticking to its guns with an interior that might appear dull, but is far from dreary. Material quality is exceptional with the infusion of high quality plastics, leather interior, and high-gloss copper trim. BMW’s designers appeared keen on sporting some refined ergonomics and the forward sweeping dash is a prime example. There is an awkwardly placed cup-holder attached to the central console and we found it to be a better spot to stow our phone than a frosty beverage. The three-spoke steering wheel is an exercise in simplicity with only a few controls flanking each side. Likewise, the instrument cluster and console controls are equally restrained, exhibiting the same level of minimalism seen throughout the cabin. Even the LCD display is tucked away atop the center dash as if not to draw too much attention. The X1’s increased ride height gave us a better vantage point when sitting up front, with the greenhouse providing a wealth of space to look out through. Seating is naturally what you’d expect from a BMW. Our review model proved exceptionally comfortable, although some added side bolstering and cushioning would be appreciated. We found a lot of space up front but full size adults will find legroom scarce in the back. The X1 is perfect for smaller families with small children; otherwise the increased utility of the larger X3 might be a better option. 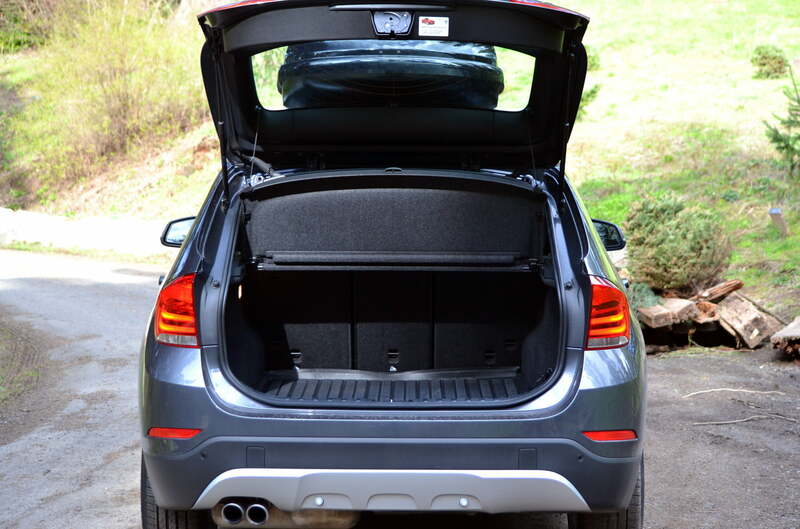 Cargo space is modest at 14.8 cubic feet, but it’s not much larger than a typical mid-sized sedan. Thankfully, with the back seats folded down, cargo space swells to a more livable 47.7 cubes. 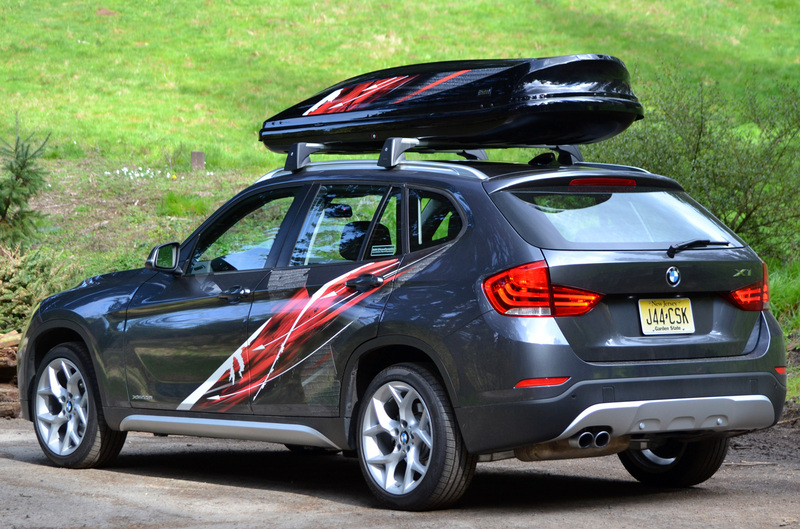 Like its larger siblings, BMW styles its X line as a group of sports activity vehicles (with no doubt and emphasis on the “sport”) and the X1 is no different. Here we have a compact, four-door crossover that rides higher than the 1 and 3 Series it’s based off of and five-inches shorter than the up until now baby of the bunch X3. Perhaps the best word to describe the X1’s interior is schizophrenic. Not because of the way the car looks, but how it made us feel. Everyday day we had a different opinion of it. Some days we appreciated its skewed, wagon-like proportions. Other days our thoughts were far less kind. Never before have we been so indecisive over a vehicle’s exterior and yet that is exactly the type of aesthetic vacillation the BMW elicits. While most will take to the X1’s interesting frame, others may find its awkward proportions too much to bear. 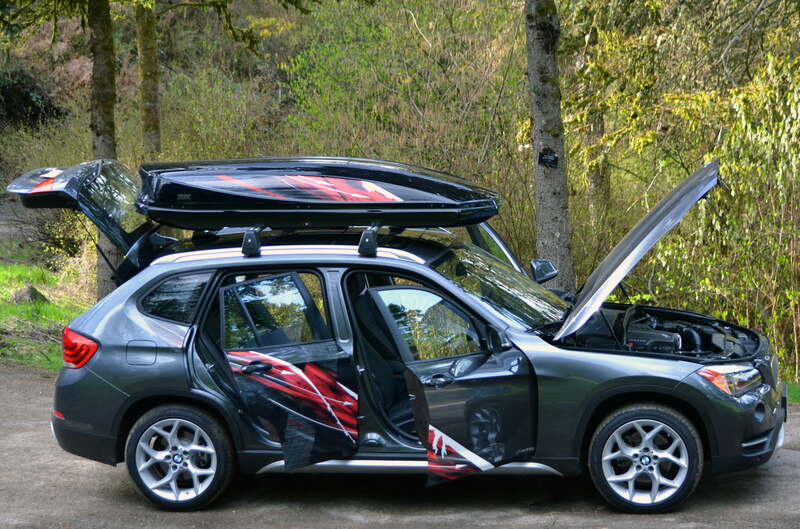 The 2013 BMW X1 is available in a number of trims and engine options. Our all-wheel drive review model, the xDrive28i ($32,500), sent power to all four wheels via a turbocharged 2.0-liter inline four-cylinder that spits out 240 horsepower and 260 pound-feet of torque. BMW also offers the X1 in rear-wheel drive configuration, so drivers who really want to emphasize the “sport” in their sport activity vehicle will want to go with the sDrive28i ($30,800), which feature the same eight-speed automatic and turbocharged inline four as the xDrive28i. Topping the X1 lineup is the xDrive35i ($38,600), which gets a turbocharged 3.0-liter inline six-cylinder. Here output is boosted to 300 hp and 300 lb-ft of torque. All-wheel drive is standard but unlike the 28is, the 35i is mated to a six-speed automatic. Due to its limited cabin and cargo space, we’re not entirely convinced about the X1’s overall practicality, but BMW has done an excellent job with the X1’s fuel efficiency. EPA estimates peg the all-wheel drive 28i at an impressive 22 mpg in the city, 33 on the highway, and 26 combined, while the sDrive slightly more efficient at 24/34/28. Unsurprisingly, the xDrive35i is the worst of the bunch, returning an EPA-estimated 18/27/21, however, given its engine size and output, that’s actually pretty decent. 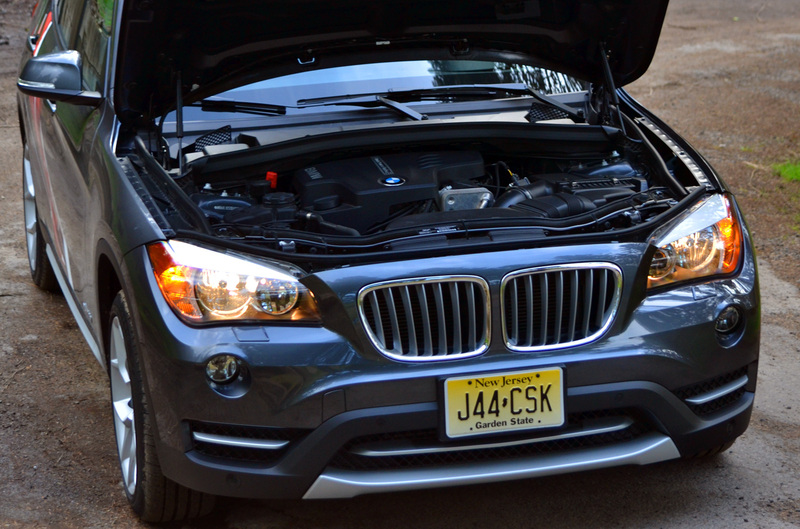 Like many of its other models, the X1 features BMW’s auto start-top function. Because cars waste precious fuel while idling, the X1’s engine shuts off when the vehicle comes to a complete stop. The thought process being that if an engine isn’t running it can’t waste fuel. Auto stop-start requires no real driver input whatsoever. Simply remove your foot from the brake pedal and the engine fires back up in the seconds before you can hit the gas. From a fuel saving standpoint, we appreciate technology like auto stop-start. The problem, however, is that it’s nowhere near as smooth as we’d like it to be. While switching off the feature entirely is accomplished easily with a press of a button, the fact that it annoyingly defaults to it every time you get in the car is beyond frustrating. When it comes to pure driving dynamics, very few automakers come close to matching the automotive mastery exhibited by BMW’s engineers. 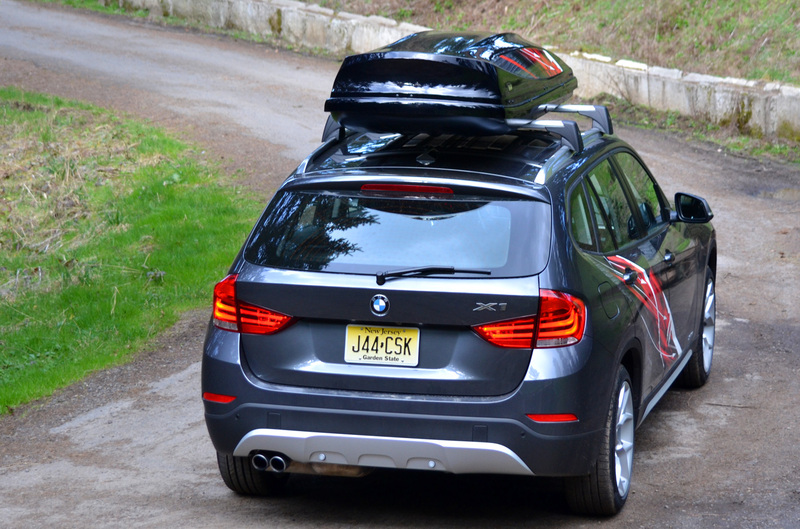 So we’re happy to report that the X1 carries those lofty expectations on its flared haunches rather well. Out on the road, how a car’s steering is tuned can dictate how well it handles overall. Thankfully, BMW really delivers in this regard. The X1’s steering is weighty, responsive, and oh so enjoyable. It took some getting used to, especially during our first few drives, where turning the wheel required much more effort than we’ve grown accustomed to, especially at lower speeds. But once we escaped the city exited the freeway and sought out more exciting driving pastures, the X1‘s steering continued to amaze. Every time we asked for more, the X1 obliged. While most automakers are busy removing that natural feedback and effort experienced while driving – all in the name of improved fuel economy – it’s nice to see BMW sticking to its performance roots. BMW does offer a performance option called Servtronic for $250. Servontronic adjusts the amount of power steering assistance based on vehicle speed. At lower speeds, the assistance is cranked up; making it is easier to turn, while at higher speeds the same assistance lets off, stiffening up the handling for added stability. Despite its stature, the X1 carries itself well. Enter a corner and the wheels stays glued to the road. Body sway is minimal and the car simply shoots out of corners with alarming urgency. Because the X1 is based off a rear-wheel drive platform, our all-wheel drive xDrive model felt incredibly nimble no matter what we threw it at. 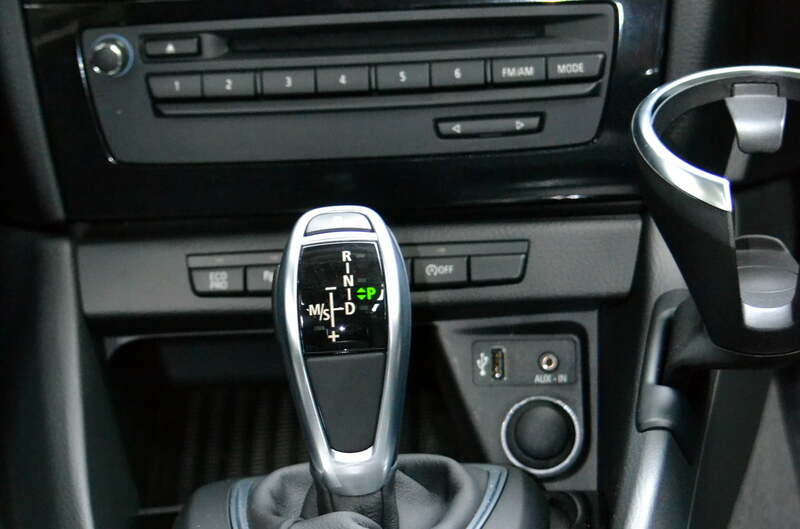 The 2013 X1 also makes use of BMW’s Dynamic Traction Control (DTC). For example, on roads with gravel where front wheel slippage can occur, the vehicle’s dynamic stability control (DSC) would normally kick in and change engine ouput, limiting the power needed for forward movement. DTC doesn’t require any limited engine output and allows the wheels to spin properly, so tackling gravel-filled corners at speed is not only acceptable, it’s encouraged. During most driving scenarios, it appears the xDrive’s torque vectoring is more inclined to send power to the real wheels, but is also more than willing to direct it to the front when called upon. Don’t let its spirited driving dynamics fool you. This isn’t a mountain tamer or off-road adventurer. 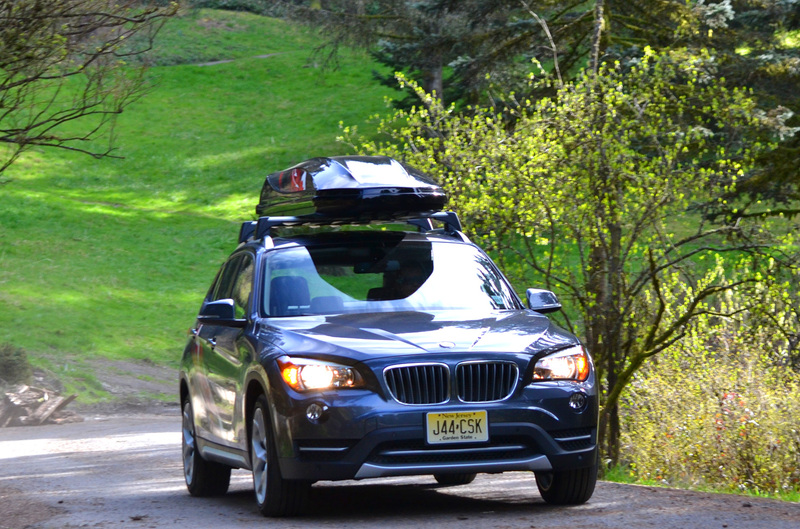 In less forgiving terrain, the X1 simply can’t retain the same level of composure as it does on the paved beaten path. There’s also the minor issue of the X1’s inept exhaust note, which isn’t the most impressive but still more than capable of evoking a smile time and again. If you prefer your engine wail more boorish, you’ll be noticeably disappointed. Blame the bureaucracy. While we’re often jealous of the vehicles Europe gets and we Americans don’t, we can’t say the same for the X1. Sure it is a (mostly) good looking crossover/wagon-on-stilts with a decent array of car tech. And sure it offers the driving dynamics you’d expect from a company that claims to build the ultimate driving machine. But despite its slightly raised height, the suggestion that the X1 will thrive on less forgiving terrain (read: off-road) is wishful thinking, which then begs the question: Why the X1 over the X3 or even the 3 Series? BMW surely envisioned the X1 as “best of both world’s” type of vehicle, but truthfully we just can’t see why anyone would pick this over the other two, especially when one offers better driving dynamics and about the same storage, and the other offers more carrying capacity and better cabin room. Throw in the fact that when fully optioned with the worthwhile tech we’d want, the X1’s base price climbs higher than the X1 can itself. What you’re left swallowing is nearly $10,000 worth of options and a final sticker price that places you well into X3 and 3 Series territory.